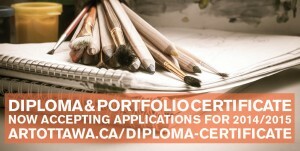 The Ottawa School of Art offers portfolio certificate students a unique program of intensive, hands-on, well-structured training in the fine art tradition of drawing, painting and sculpture. Through a challenging well-designed year of full time study, OSA students gain confidence and an understanding of what a professional portfolio contains and they learn how to present their ideas in an interview. While no certificate program guarantees a student’s success in the marketplace nor does it provide automatic entry into a desired program of study, OSA students are out in front with a strong confident understanding of the playing field. Very high percentages of the Portfolio Certificate graduates gain entry into one of their top choice schools.